Shane Shirley : Emeril Raves and You Save on Seven Oaks Ranch Garlic Gold Organics! Free Shipping on Orders Over $45!! Emeril Raves and You Save on Seven Oaks Ranch Garlic Gold Organics! Free Shipping on Orders Over $45!! I am not a gourmet chef but that certainly doesn't mean that I don't like to cook like one! Although it can be a challenge at times, I really enjoy cooking dinner for my family each night. I think family dinner time provides a great way to connect the ties that bind a family together. Getting dinner on the table can be tough at times as two of my girls are pretty picky eaters and I cannot stand cooking two meals for one my family! Well guess what? I have found Seven Oaks Ranch Garlic Gold Organics and the pros like Emeril Lagasse rave about, my entire family loves it and this week you can pick up some Garlic Gold Organic Olive Oil and Crunchy Nuggets and SAVE with FREE SHIPPING! 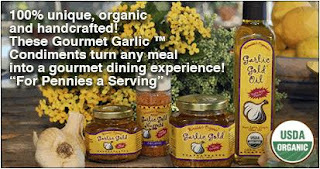 I just found out that Emeril Lagasse is into green and he calls Garlic Gold the Gold Standard - "Garlic Gold is a delicious combination of organic toasted garlic pieces and organic extra-virgin olive oil. This stunner adds unique flavor and texture to anything from vegetables to chicken, shrimp or beef and if you dare, a savory panna cotta. It’s dynamite in salad dressing and the nuggets are especially tasty as crouton replacements or sprinkled atop a split loaf of crusty bread, slathered in butter - the ultimate in garlic bread." So the smell, taste and versatility of Garlic Gold made me a fan along with Emeril, but there is more to love with Seven Oaks Ranch and their Organic garlic Gold. 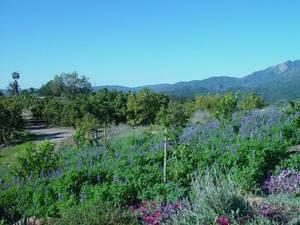 The Organic home of Garlic Gold®, Seven Oaks Ranch, is a 12.5 acre Organic ranch nestled in the Ojai Valley in California. Proponents of sustainability, Seven Oaks utilizes solar electricity to power the ranch and when possible electric and hybrid vehicles, along with a long list of cutting edge sustainable farming practices. But wait, there's more (can you tell I love this stuff? )...not only is the Seven Oaks Ranch totally organic and committed to protecting our planet, but the products they produce there with so much care are actually super good for us! According to a study by the University of Alabama, Birmingham, a garlic-rich diet appears to protect against various cancers, including breast, prostate and colon cancer and may also protect the heart. Plus, according to the Food and Drug Administration (FDA), consuming about 2 tablespoons (23 grams) of olive oil a day may reduce your risk of heart disease. Being the gourmet chef that I am, I really wasn't sure how to use these two products at first so I just made some chicken in a pan with the Garlic Gold Oil and let me tell you that every single one of my family members ate it up! The smell was just incredible and the taste was light but yet unique and absolutely flavorful. Then I added the Garlic Gold to some mashed potatoes and I will tell you that the garlic is a bit stronger in the crunchy nuggets than the oil alone but I loved the potatoes! The crunchy little nuggets in olive oil really added a great dimension to same old mashed potatoes! I am now thinking of all of the ways I can add it to my meals for my family: salads, veggies, eggs, breads, shrimp, pizza, fish and meats...Yummy! I am thinking it is almost Garlic Gold time! I swear to you when you smell and taste this stuff you will just be like OMG!! Head over to and pick up the Garlic Gold Organic Sampler and get free shipping with orders over $45!